You graduated medical school and are officially an MD or DO. The funny thing is, you may not feel ready to be responsible for other peoples’ lives just yet. But guess what? You are responsible. The good news is, you’re not alone; you’ll still have senior residents and attending physicians to guide you. You graduated medical school and are officially an MD or DO. The funny thing is, you may not feel ready to be responsible for other peoples’ lives just yet. But guess what? You are responsible. The good news is, you’re not alone; you’ll still have senior residents and attending physicians to guide you. Still, it can be a bit intimidating to start your residency. Keeping some of the following tips in mind may help you get through the next few years. Be well prepared or pay the price: As a resident, you may be presenting cases to attending physicians. If you appear unprepared, not only does it hurt your ability to provide the best care possible, it hurts your reputation. Arrive early to review patients’ labs, nursing notes, and other physicians’ progress notes. Know what you’re talking about. Take nothing personally: There may be instances when patients are rude, attending physicians are condescending, and nurses are sarcastic. Although there are times you need to speak up, it’s also helpful to develop a thick skin. You can function on less sleep than you thought: Your schedule, including how often you take call may vary, based on your specialty. In many instances, you’ll probably work on very little sleep. Your body adjusts. Everyone feels unsure of him or herself at times: There will be good days and bad days during residency. You will have days you’ll doubt what you’re doing, if you’re doing it well, and why you’re even there. Hang in there. Doubts are normal. You’ll gain more confidence in time. Mistakes will probably happen: If you’re human, you are bound to make a mistake. The good news is most of the time you won’t seriously hurt anyone. When you goof up, learn what you can from the experience and move forward. You still have a lot to learn: While you learned a lot in med school, it’s important to realize there is still a lot you need to know. Medicine is so complex. You’ll continue to learn throughout your career. Being open to the fact there is more to know will make you a better doctor. Some patients don’t want help: In med school, you probably already encountered patients who were uncooperative and didn’t want help. Talk with your patients and educate them about the consequences of being non-compliant. In some cases, there is not much you can do. Patients have the right to choose their own path, even if you don’t agree with it. Bedside manner matters: You’re used to hospitals, medical terminology, and dealing with serious medical conditions, but to a non-medical person, dealing with a hospitalization can be overwhelming and intimidating. Your attitude can help. 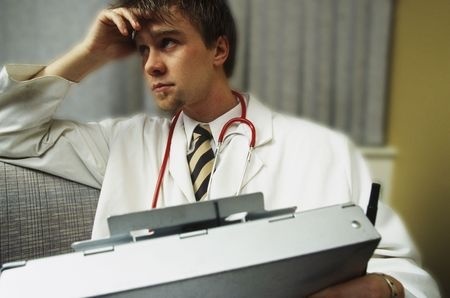 Don’t get so caught up in tasks that you forget the human aspect of being a doctor. Kindness goes a long way in making someone feel better. Enjoy your time off as much as possible: Although you will be busy during residency, you still get time off. Enjoy it as much as possible. Find ways to relax and recharge. Everyone needs downtime. Spend time with people you care about, take a vacation, exercise, or just chill. Whatever you choose to do when you are away from work, try to leave work at work and have fun. Keep perspective: Medical school is tough, and residency may even be tougher. Remember that you have the opportunity to make a difference in someone’s life during possibly the most challenging moments. You may also help patients survive, and some you may help die peacefully. Although that’s a lot of responsibility, it’s also a gift. To make such a difference on a day-to-day basis is a privilege that many people don’t get. Try to hold on to that on your toughest days. As a bonus tip we would like to suggest using HospitalRecruiting.com as a resource for your job search during the last couple years of residency. Finding time to conduct a thorough job search is usually a major challenge for resident physicians and our physician job board will make life easier by presenting a varried and up to date list of opportunities. It also tracks jobs, provides updates when positions have been filled or placed on hold, and provides space to keep notes on opportunities of interest. And finally, best of luck with your medical residency! It will be amoung the toughest tests of your life, but as Theodore Rosevelt once said, “Nothing worth having comes easy”.